‘Funder-led. Bureaucratic. Time-consuming. Misunderstood.’ All words that have been used to describe UK grant reporting – the process (or processes) by which charities report their progress to funders. No matter how simple and clear an individual funder’s system might be, the current approach forces charities to repackage similar information for different funders, on different dates, with different word counts and in different formats. 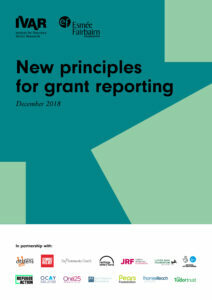 A group of funders and charities have developed a set of principles to make grant reporting a shared, more meaningful and mutually beneficial experience. These have now been published, and are being tested by nine independent funders. We are asking for feedback from UK charities and charitable trusts and foundations. In summer 2019, we will reconvene the group of funders and funded organisations who developed the principles to review and refresh them. Read more about the project here, or get in touch to join the group of funders testing the principles.